Say you have a relatively long joint chain, like a spine. Right now, selecting the root joint and rotating has the same effect as selecting all the joint in the chain and rotating. I propose that if you have several joints selected in a chain,rotating them will cause each one to rotate individually in the chain. This would allow much easier FK animation of necks and spines. don't think this is a good idea, you're violating what parenting is about. next bone, not child to either bone. copy loc constraint, applied to the "next bone" target the small child target. rinse, repeat. apply copy rot constraint from child bone to control bone. you're violating what parenting is about. How would this violate parenting? If you individaully rotate joints they maintain their relative position in the hierarchy, all I'm suggesting is the same thing without having to rotate each bone one by one. You would still be able to rotate parent bones individually without their children rotating if thats what you needed. this is actuyll what i'd expect when "indivisual centers" is selected (header). .. but i hardly "miss" such a feature. when it comes to spines and such, i rely more on tricky setups with constraints, or now with the new features, on the hooks and path-deform. I think thats the problem! Tricky setups. The way I'm suggesting is the way Maya handles bone rotations; not sure about other packages. The new hooks are cool, I actually used them recently for the weekend animtion challenge over at elysiun. It helped me to keep my characers legs from collapsing as her leg kicks up high; impossible with smooth skinning alone. True. I understand their are work-arounds, and theirs a way to do anything if you know what you're doing. I'm just proposing this as a posibility for the future; what I'm propsing seems more intuitive then having to rig up a bunch of constraints, at least to me. I have no idea how much work this would be, maybe it would require that the entire armature system be re-written! If that was the case then forget it, its not that important. If it is possible, I think it should be considered. well, the fact is the constraint system is a current interface to do what you want. It could be easier- for instance, a constraint that translated the "child" to the "parent"'s tip would get rid of the need for a third bone. I actually prefer the rotate like method- it allows for a clean split between "skinable" geometry bones and control bones, at least , I like it in the spine example- but there are other uses for this. Other interfaces would be multiple bone types, more options on fk chains (changing the default behaviour would break current rigs), etc. But these things are harder to add than constraints, and should be done with an eye to how the total system will behave. I'm interested in the method you've outlined here, but I think I may be setting them up wrong. When I set up bones in these 2 methods, what I get is a child bone that stays attatched to the parent but does not rotate as the parent rotates. Heres an image so I know we're both thinking of the same thing. The left armature is in the default state, the middle armature has it's root rotated 10 degrees, and the right most armature has each bone individually rotated 10 degrees. The right most one is the system I'm looking for, so I can freely rotate the spine as a whole. Is this possible with the examples you gave? you can do what you want- might get a little intricate- but it is a setup I'm unfamiliar with. Of course, you might be asking about the spline IK idea, in which case there is a thread about this somewhere in this forum. Yeah , each one rotates individually. This is not good for a true anatomically correct creature, but it should suffice for cartoonish characters. yeah zbgump, that's a bit more of an intricate setup, harder to do. How do you want to control it? master control bone, that sends it's rotation to the childeren? or do you want to move a target IK style, and have the chain try to follow with this constraint? I've never seen a spine rigged this way btw. Live and learn I guess. Oh yeah, path deform for bones should be the ticket I think. Tell you the truth, I set up my current characters spine with the first suggestion you gave, and it works pretty good. solmax wrote: this is actuyll what i'd expect when "indivisual centers" is selected (header). .. but i hardly "miss" such a feature. when it comes to spines and such, i rely more on tricky setups with constraints, or now with the new features, on the hooks and path-deform. The problem is that the feature that was asked for was a manipulation tool that actually changes the bones rotation data. Constraints on the other hand only change the objects matrix but leave it's location and rotation data alone. I have wanted this feature for a long time, as it is extremely usefull in several high end packages I have used. Also we need a inverse kinemantics manipulation mode similar to cinema4d or hoow animation masters bones work. Once again this is not the same as a constraint at all. You just select a bone in a chain and manipulate it with IK and it modifies the actual rotation data so you can set FK keys. This works really well for arms and personally I try to use FK keying as much as possible in other apps like Motionbuilder. The only IK constraint I use most of the time is the floor constraint, which is nothing like blenders IK constraint. 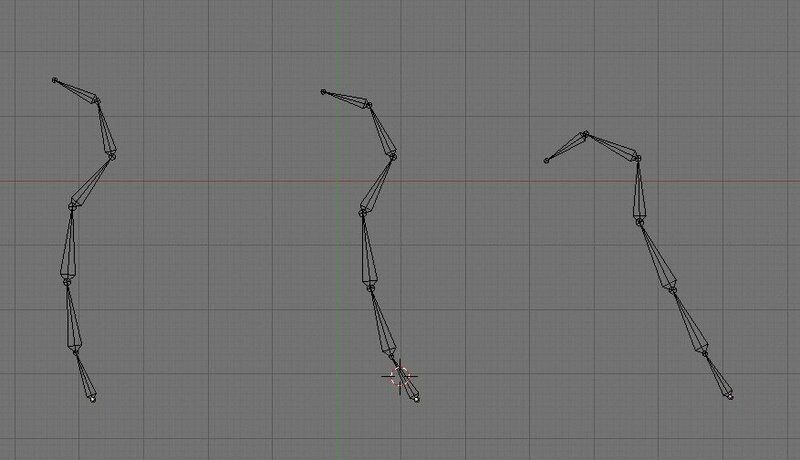 With better FK and IK *posing* tools in blender we could add 'pose strips' to the nla system that key a whole skeletons pose at once without constraints or individual bone channels. The pose track could have an option for 'auto ik'; when a joint does not move between poses the limb it belongs to is an ik chain for that frame range. Everything else is fk with nice arcing motions. This is how apps like animanium work and I think it's a wonderfull way of animating that is clean and hassle free. Of course it should be possible to blend pose tracks with action tracks and constraint tracks if the user wanted to.